Fleur (bully) personally attacks Chris (victim) in an executive team meeting. Afterwards, Chris goes and complains to Rohit about Fleur’s behaviour. Rohit (rescuer) offers to go tell Fleur to stop. Jimmy (bully) is talking to Lee at the water cooler and starts saying negative things about Veronica (victim). None of these positions is useful, and if you find yourself in any one of them … stop playing that role. Let’s look at each of them in turn. While it is fine to disagree and debate ideas, it is never OK to attack someone else personally. If you engage in bullying: stop. Apart from being wrong, it’s a bad career move. A formal bullying complaint can be career-ending (not just at your current organisation, but across an entire market). Besides, no one likes a bully, even if folks will sometimes cheer them on from the sidelines. If you’re known as a bully, the moment you find yourself vulnerable, you’ll likely find yourself either attacked, or isolated, without an ally to be found. It can be devastating. Finally, as a leader, you play a key role in setting the organisations culture, and research has demonstrated over and over that bullying cultures tend to be negatively correlated with organisational performance. Note, there are some cases where bullies don’t realise what they’re doing. A lack of awareness of relative power is a common cause of this. For example, a boss might say something in jest to a subordinate, without realising the true impact her comment has. You can see an excruciatingly funny example in this scene from The Office. Leaders cast a long shadow: the more senior you are, the more impact your comments have. Top executives in particular need to ensure that the impact of their actions is aligned with their original intent. If you feel you’re the subject of bullying, you have a choice. You can accept the role of victim, which is ultimately one of powerlessness; or you can take a more proactive stance and think about what you can do to change the situation. The latter is a far more useful. Think how much more empowered and effective you’d feel if you took charge and decided to resolve things for yourself. For example, you might confront the bully and reset boundaries, effectively saying “I will not accept this behaviour from you.” Deep down, bullies are generally cowards, and as soon as a victim pushes back, they’ll tend to move on to find someone else to attack. This article ‘Protecting Your Turf’ shares a practical, effective model for having conversations to set (or re-set) boundaries after they have been transgressed. If a colleague approaches you to complain about being bullied, see if you are able to coach them to work out for themselves what course of action they want to take. This is generally far more helpful and empowering for the victim than you taking on the role of rescuer. While riding in on a white horse to protect a colleague – or being a consoling shoulder for them to cry on – may feel good, it is actually counterproductive. The message you’re sending the victim is “You have no power in this situation. Every time someone tries to bully you, you need to go find a strong friend to protect you, because you can’t stand up for yourself.” This fundamentally undermines the victim, and reinforces their lack of agency. Rather than taking on the role of rescuer, a far more useful approach for you to take is to coach the would-be victim on what they want to do about the situation, and help them find their own voice and sense of control. This helps the victim to realise that they can actually resolve things for themselves. We see Drama Triangles everywhere, and they are never useful. 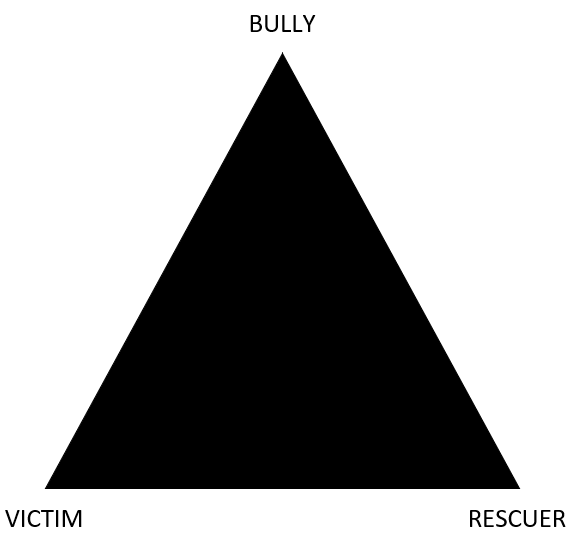 Whenever you see yourself being cast in the role of bully, victim or rescuer, stop playing that role. A good place to start is to avoid triangles altogether. If someone has an issue with someone else, encourage them to talk directly to the other person to resolve things, rather than creating a triangle through you. It’s OK to coach a colleague as they prepare to have a difficult conversation with someone else, but it is rarely helpful for you to have the conversation on their behalf.